The Bank of Spain had chosen two consultants so that they value the Spanish banks’ assets. The purpose of this evaluation is to “increase transparency and definitively dispel doubts about the valuation of bank assets in Spain”, Economy Ministry sources said. The independent consultants selected are the German Roland Berger, and Oliver Wyman of the United States. Oliver Wyman has a dark point on his curriculum as he classified Anglo Irish Bank as the best in the world in 2006, just two years before this bank was nationalized. 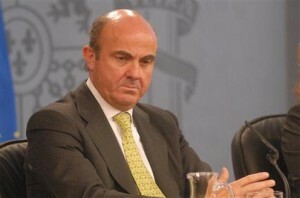 Economy Minister Luis de Guindos refused on Monday any further serious regression in home loan defaults. The performing loan ratio for mortgages currently stands at 2.8 percent, compared with 21 percent for credit to the real estate sector. The banking system’s loan portfolio is currently around 1.76 trillion euros, of which 656 billion is in the form of mortgages to individual homeowners and around 310 billion to property developers. In a decree approved earlier this month, the government increased provisions for loans to developers to up 45 percent of the value of the credit. ...continue reading "Spanish Banking System under exam"